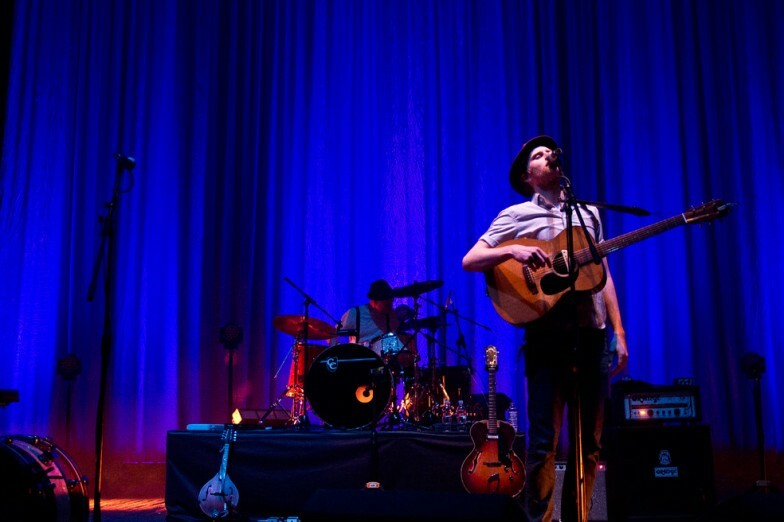 “Thank you for making us feel nervous” says The Lumineers’ leading man Wesley Keith Schultz halfway through their sold out set at London’s Brixton Academy. Coming from a band who within a year managed to peak on the Billboard chart with their debut album, released the most shared song in Manhattan according to Spotify, yes the hit single “Ho Hey”, and performed at the Grammy Awards having two nominations, saying something like this really meant a lot. It was the last concert before a break in their tour itinerary waiting for Australia to clap their hands just like Brixton did during this night. 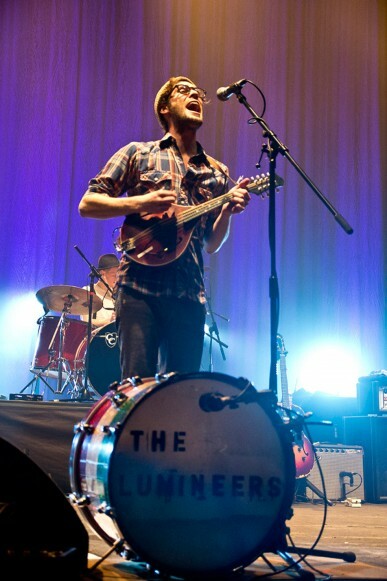 There were five thousand people in the biggest venue The Lumineers performed so far and the storytellers from Denver, Colorado, put on a rapturous show who took the audience to a front row experience in a true Americana folk-rock festival. Taking the stage after opening act Langhorne Slim, a fellow alternative country musician, The Lumineers opened the night with the ironic song “Classy Girls”, the ones who according to them don’t kiss in bars. Nevertheless the bars in the venue were busy in selling pints of beer as we saw Wesley playing the guitar and moving his hat all over the place, Jeremiah Caleb Fraites starting off the drums and hitting them with his tambourine dressed in what it’s becoming an iconic white t-shirt and black braces outfit, and the lady of the trio Neyla Pekarek, taking her place on the cello with that aura of someone who is dreamy and just came out from the land of Oz. Thanks to the authentic simplicity of their music, “Anyone who can play an instrument can play a Lumineers song” they stated, and the powerful percussions, it was pretty clear within the first bunch of songs that the album had a whole new vibe when performed live. It sounds powerful in moments like “Flowers In Your Head” and more intimate and haunting during “Slow It Down”, where Wesley’s solo is illuminated by purple lights. The cinematic aspect of their music comes to life on a stage that breathes a far away folkloristic air where band members Ben Wahamaki on the bass and barefoot StelthUlvang on the piano not only add up to the live renditions but also draw the audience into the show and the whole band works beautifully as one, just like old time friends. As soon as they manage to have silence in the house, “Hey Ho” is entirely performed without microphones, there are no barriers between stage and audience and the sing-along gets contagious. We finally get to hear Neyla’s voice during a duet with Wesley of a brand new love song, “Drama Queen” and the moment she starts singing she is overwhelmed by the screaming crowd. 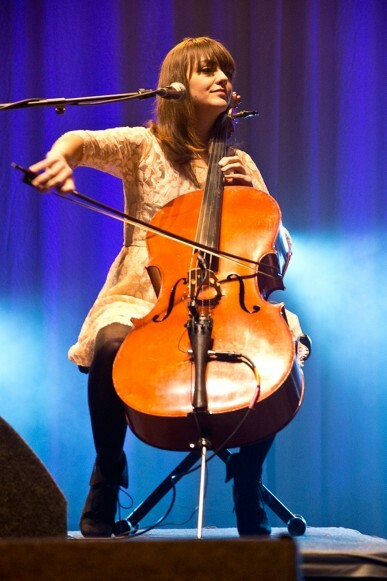 Hopefully we will hear more from her in the next album and the same is for the breathtaking moments given by Mr. Schultz’s voice during Bob Dylan’s cover of “Subterranean Homesick Blues” and another crowd’s favorite, the emotional “Stubborn Love”. Everyone on the balcony was on their feet, the hand clapping started spontaneously and we believed every word he sang, “It’s better to feel pain, than nothing at all”. “Ho Hey” is performed again by the band this time, because you just can’t get enough of it can you? 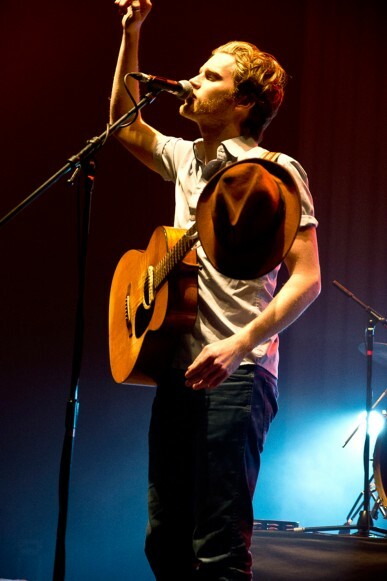 The Lumineers trio is alone for “Charlie Boy” and later on Jeremiah opens with a xylophone intro the last song of the set, a story about those young western women of the Roaring 20’s who wore short skirts, excessive make up, listened to jazz and couldn’t be bothered by the norms of society, “Flapper Girl”. The last solo moment of Wesley opens the encore, it took three years to have it finished he says, and “Morning Song” it’s a story infused with that disappointment that only Hollywood or a broken heart can give. Guitars, bouzouki, mandolin, accordion, banjo and the last round of hand claps approach with the finale made of “Big Parade”, with its inviting and colorful rhythm and a cover of Violent Femmes’ “American Music” that brings the exhilarating party to an end together with Langhorne Slim. The big parade of The Lumineers told their story, shook the place up, bowed, and left us with their choruses stuck in our heads on the way out. Tales of love, freedom, and everyday life, something that even an overproduced show can’t top. Ho! Hey!